Silverton Together partners with Silverton Garden Club in hosting the fourth annual Silverton Garden Tour, a self-guided journey through eight diverse gardens scattered throughout the Silverton area. Several businesses and other organizations are providing help through donations, door prizes and volunteering. Kuhn said a distinction of Silverton’s event versus those in the Portland area is having all the garden owners on site and available to discuss plants, gardening and the obstacles they’ve overcome in the formation of their own landscape. “It provides the opportunity to interact with people who are in love with gardening and have fulfilled their own vision in the garden they have,” Kuhn said. 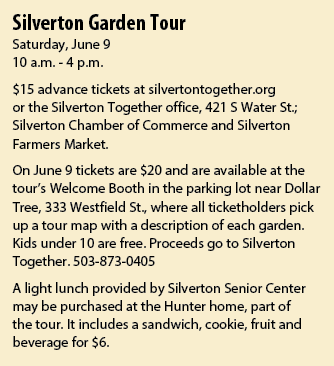 Hunter’s garden is part of the tour and the site of a light lunch put on by Silverton Senior Center. Living near the hospital, she and husband Ray get to share their garden with passersby on a regular basis. Among the gardens visitors will see many rare specimens including a 100-year-old Japanese maple, lesser known perennials and ways of incorporating art and individuality into a garden. 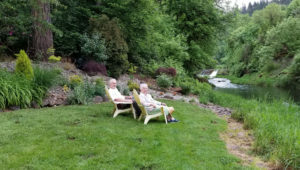 “Most of our gardens have been owned by these folks for many years and I think their personality becomes reflected in the style and layout of the garden,” Kuhn said. Prior to retirement Kuhn found gardening a good way to relax after a stressful day of serving kids with high mental health needs. “Usually people leave service and don’t really know how things turn out but with your garden you can see the result of your work immediately,” he said. Kuhn helped found Silverton Together 25 years ago. Its primary aim is to strengthen and support families through providing them the tools, skills and support to successfully raise their kids.